Most of us have seen examples of Western-style calligraphy. It is stunningly beautiful, primarily done with black ink, and creates each letter in an elegant, even style. While the "reading" text done in calligraphy is usually fairly straightforward and monochromatic, there is sometimes an initial capital letter which has extra flourishes. This type of letter is called an illuminated, or painted, letter. The word "illuminated" here doesn't mean "lit up" like a light bulb. Rather, it means "brought to life" with colors and paint. Illuminated letters got their start way back in the 500s and were often used by monks and scribes to add interest to their documents. 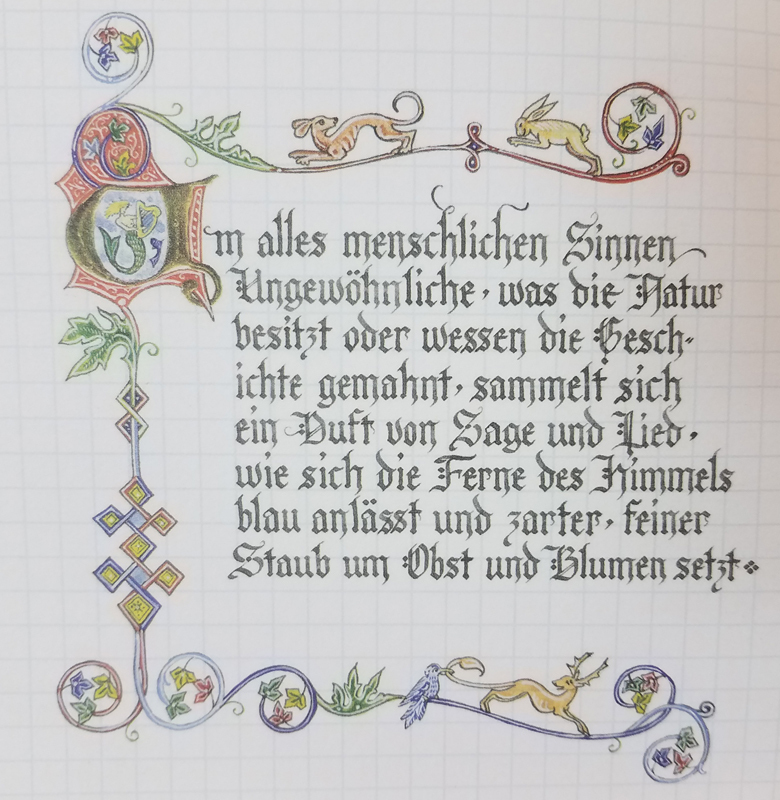 Here's an example from this book, the Illuminated Letters Sketchbook by Jane Sullivan. See how that first letter draws your eye and gets you to start reading? So the first thing to note about Jane Sullivan's book is that it does NOT TEACH YOU BASIC CALLIGRAPHY. Which is a good thing. If you want to learn calligraphy you should really watch a video rather than look at a book. Much of calligraphy is about the position of the hand and the way the ink moves across the paper. Trying to learn the motion of calligraphy from a two-dimensional book page is quite challenging. It's so much easier to watch a video which lets you see the hand in motion, how the pen is held, and so on. This book here is about inspiring you to draw your very own beautiful initial illuminated letters. Illuminated letters are fantastic for creating bookmarks, t-shirts, journal covers, you name it. A key to illuminated letters is that every one is unique. The way you choose to draw yours would be vastly different than how I draw mine. Maybe you like roses and vines. Maybe I like cats and tulips. We add our own personal touches to our letters. That is what makes them so beautiful. So, yes, Jane starts with a background of what illuminating letters was about. She talks about how you can do the painting with watercolor or gouache, with colored pencil or marker. It's all up to you. And then she gets right into it. She provides you with beautiful examples to get you started. Some have leaves. Some flowers. Some cats. Some butterflies. 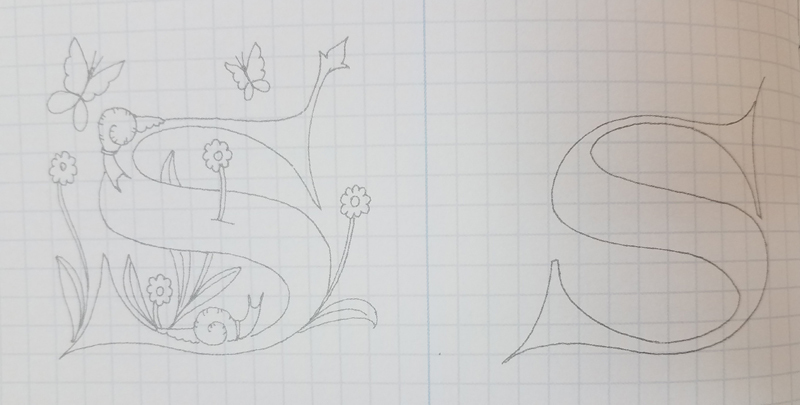 Here's the letter L.
But the aim isn't to have you simply trace her design and duplicate it over and over again, although of course you could do that if you wanted. The aim is to INSPIRE you to now try your own combinations which speak to you. Maybe you take some leaves from her letter A example and tuck in a flourish from the P. Maybe the butterflies from the E latch on to the snail from J. She also has all sorts of examples of green-man-style faces, geometric shapes, swirls, horses, you name it. Again, though, the aim isn't for you to just trace and copy her examples. She's giving you a boost. Getting you started. She has grid paper for you to practice and explore. But this launching pad is to help you then design your OWN letters. If you adore hummingbirds, add those in! Delighted by your tiger barb fish? Have them swim through your S! She gives you tons of examples and plenty of "base letters" to start with. And then the sky is the limit. I'm president of my local Blackstone Valley Art Organization and I bring this book in to our calligraphy workshop sessions. It's just so inspiring. It gets people talking and thinking. I see that some reviewers complain that Jane did not "tell you" how to make your letters. I'm not sure I understand that complaint. She gives you a great range of inspiration to work with, including basic letters, drawn letters, and colored-in letters. Yes, this is not a book on "how to draw". There are plenty of those out there. It's also not a book of "how to paint with watercolors." Jane would have no idea if you enjoy painting with watercolors, gouache, colored pencil, watercolor pencil, colored markers, etc. It's up to you to use whichever appeals to you the most. 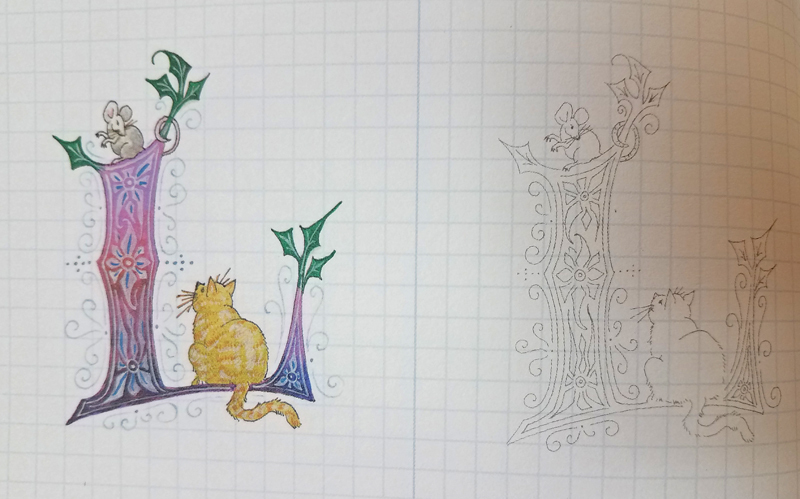 Jane's book is about inspiring you to create illuminated letters in your own personal style. So, to summarize. This will NOT teach you basic calligraphy. It's not what it's about. It doesn't teach you how to paint with watercolors. There are plenty of books on that. What it does is help you understand how illuminated letters can be made in a variety of styles. It gives you the shapes and grids to practice your own. It launches you out. And then you create styles which represent your personal interests. You color them in with whatever type of coloring appeals to you.